We owe Illuminations a huge debt of gratitude. Its ongoing ‘Screen Plays’ series, reviving and making available classic television productions, has already brought us An Age of Kings and The Wars of the Roses, and now it delivers a beautifully transferred recording of Deborah Warner’s seminal Richard II, the 1997 television version of the 1995 National Theatre production. I’ve only seen clips of this film before, and am delighted to find it as fascinating and rich as those brief glimpses had promised. The timing of the release couldn’t be better, coming as it does hot on the heels of the Royal Exchange’s Hamlet, the RSC’s Cymbeline, the Old Vic’s King Lear and the Donmar’s Shakespeare trilogy. 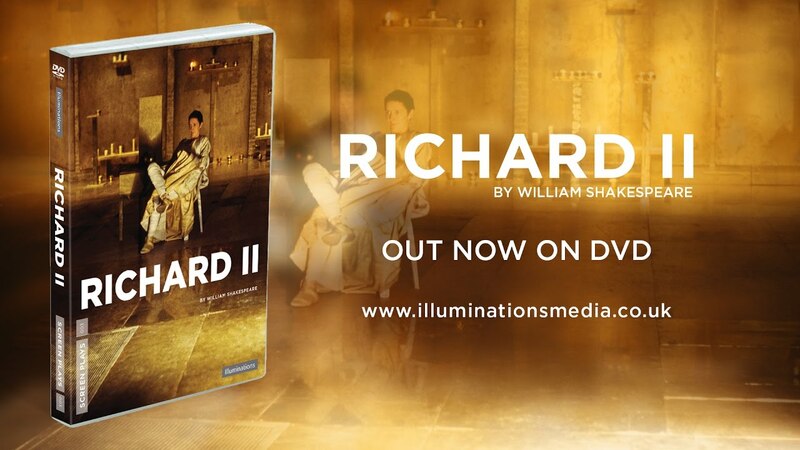 The ‘moment’ of women playing Shakespeare’s leading male roles on a widespread scale has finally arrived, and as such it feels fitting that Fiona Shaw’s breath-taking Richard II can now also reach a broader audience, twenty years on. There isn’t a weak link in the cast, but this is Shaw’s film, and the camera knows it, from the opening shot as a clapperboard hovers in front of her face, captured in close-up and slow-motion as (I presume) Warner herself prepares the image of her king. The meta-filmic opening is incongruous with what follows, but frames Richard’s serene presence even as the words of the first scene play as voice over in his head. Shaw is captivating, an otherworldly and authoritative presence surrounded by prosaic, mundane human beings. He is an aspirational figure, adored and idolised by the ever-gazing Aumerle (an angelic-looking Julian Rhind-Tutt). Richard’s smile is bestowed, not given; when it is earned, the corners of Shaw’s mouth turn up slightly and the eyes beam as the head tilts slightly; when this happens, the film captures the near-ecstatic reactions of the beneficiaries. Shaw’s Richard is someone who will believably be fought for, and whose presence captures the indescribable quality of ‘royal’. When he appears for the public handing over of the crown, Richard puts his hand casually on the back of Bolingbroke’s throne, sauntering into the room with an easy, polite grace that effects an immediate dead silence in the room; an astonishing contrast with the loud self-assertions of the feuding nobles that had immediately preceded her appearance. I use ‘he’ in deference to the production’s retention of male pronouns for Richard, though in truth the production is built around the ambiguity of Richard’s gender presentation. Richard rules through a cult of love that includes passionate kisses of Richard Bremmer’s Bolingbroke, first bestowed during the opening pleas and later demanded by Bolingbroke as he prepares to join Mowbray in the lists. When Graham Crowden’s Gaunt bids farewell to his king, by contrast, he reaches with his hands and forces his lips onto the appalled Richard’s. Richard’s cult is based around his body, and Shaw uses it to great effect by carefully controlling the kind and extent of physical contact Richard allows. Richard is untouchable, and attempts to violate Richard’s physical space are genuinely shocking. But this control of his body doesn’t translate to control of himself. During the scene at the lists – thrillingly shot in an accelerating flurry of fast edits while lackeys prepare for the clash of two unseen horses – the camera returns repeatedly to Richard’s overwhelmed face until he drops his sceptre and swoons. When Gaunt threatens his authority, Richard lashes out and throws furniture after the departing dying man in a petulant rage. And in the deposition scene – a one-person acting masterclass – Shaw shifts from the aforementioned serenity to flustered pacing to uncontrollable sobbing as Richard puts his arms around Bolingbroke’s neck, and finally returns to his default of a proud, emotional superiority. Shaw’s measured, precise voice is honoured with absolute silence in the surrounding ambience at all times. This isn’t a one-person show, of course. Bremmer’s Bolingbroke enjoys his own share of privileged close-ups, but is hideous in comparison to Richard. His age and weariness show from the start in the walking stick that he relies heavily on, and his voice is coarse and broken. He knows he is no match in natural authority for Richard, and is at a loss to do anything but stand still while Richard moves about him during the deposition scene. His unglamorous, brusque nature is framed throughout as unattractive; while he may be practically minded, he cannot carry himself with the authority of Richard, and so he depends on his underlings – especially Struan Rodger’s sneering Northumberland – to carry out his actions. Richard’s supporters are required to carry the audience’s implied love for Richard in their performances, and this is done most ably by Rhind-Tutt and Sian Thomas as a French-accented Queen Isabel. Rhind-Tutt is outstanding as Aumerle, standing from the film’s opening with Bushy, Bagot and Green and entirely devoted to Richard. Aumerle comes into his own first in the horrendously shot return to England, where the characters are barely visible against a seering white backdrop (I rather wish the transfer had been able to do something about this); while the scene is somewhat painful to watch, the connection between Aumerle and Richard begins to emerge in their close proximity and shared looks as the messengers arrive. He is painted as heroic when the nobles turn on him before the deposition scene; framed in a narrow courtroom, Aumerle stands alone and noble, upright in his defence of his king while beset by enemies. Thomas’s Isabel, meanwhile, is an emotional and distraught figure, not lacking in her own dignity but showing the emotion for both herself and her husband. Their leave-taking, with Northumberland leering on, is perhaps the film’s most moving moment, as Richard quietly and gently holds out his hand to his queen as she tries to suppress her tears. I really, really wish Illuminations would do some proper checking of their packaging materials. The most egregious error in this release is the singling out of Paola Dionisotti as the Duchess of York on the back cover, despite the fact that the Duchess of York is entirely cut from the film. Dionisotti does play the Duchess of Gloucester, as the booklet gets correct, and is brilliant in her brief scene of anguish leading into the beginnings of forgetfulness and distress as she parts from Gaunt. In some ways it’s a shame not to see Dionisotti, Rhind-Tutt and Donald Sinden try out the family comedy of the Yorks, but the film instead takes the bold step of streamlining the closing sequences of the play – after Richard’s deposition and the leave-taking with Anne, the film takes only a brief moment on Exton’s plot to murder Richard before going straight to the prison. Please note when planning your viewing – the advertised 150-minute running time includes the extras, and the film itself is only a hair over two hours long. As such, the film always returns to Richard. The soliloquy that opens the final scene begins with a series of undefined, moving shapes, then moves to a shot of Shaw, sitting stock-still against a wall and barely moving as Richard philosophises in quiet, measured sighs. As the camera gets close to Shaw, the film begins cutting between her soliloquy, her occasionally darting eyes the only betrayal of external concern, and slow-motion images of the murderers arriving, fighting and killing Richard. The image of Richard being thrown down into the shallow water of the prison floor while Shaw concludes her speech with ‘and love to Richard / Is a strange brooch in this all-hating world’ is a moving end, and the end credits roll over a slowed down crawl of Henry kissing Richard’s body before lifting the crown. An interview with Shaw reminisces about the production’s filming and light controversy: ‘I was a woman, presenting really as a man, presenting as a female in relation to his cousin Bolingbroke, who is a man. I mean, there’s much bigger language for this now, so it may seem very naïve, but at the time we had great fun with this idea’. Shaw’s contextualisation of the film’s moment and its exploration of ideas that were ‘threatening’ at their time is a great resource, and a useful addition to the package. This is supported by John Wyver’s curation of extracts of the original production’s reception; while I would have enjoyed a longer essay about the production contexts, these initial reactions show a critical community wrestling with the language to capture the performance and production; Shaw herself captures it best with ‘I’m not playing a man. I’m playing a king’. Deborah Warner also contributes an interview introducing her work on the original production and her feeling that gender quickly falls away as a matter of importance; it is the intelligence of the actor that counts. Fascinatingly, Warner suggests that Richard was ‘wrong’ not only in being a man but in being human; the production’s interest is in Richard’s wrestling with these identity issues. Fittingly, it is left to Warner to make the connections back to the 2016 Donmar productions, but noting that she felt involved in ‘the theatre experiment’ rather than a gender experiment, even if the twenty subsequent years have placed more emphasis on the latter. It’s a fitting place to end the disc, and a tribute to the necessary return to circulation of this important film.